Research - Patricio Becerra, Ph.D.
My broad area of research within planetary science studies the surfaces of solid planetary bodies in order to learn about their geologic and environmental history. My approach to this is through the analysis of remote sensing data such as images (HiRISE, CaSSIS, OSIRIS), radar (SHARAD), or spectroscopic measurements (CRISM). I then interpret these observations by constructing physical and numerical models of the geologic features and phenomena, which allows me to infer a relationship between the observed geology and the conditions under which it may have formed. Specifically, I study ices on planetary bodies, with a particular focus on the polar regions of Mars and their relationship to current and past climates. During my Ph.D. at the University of Arizona's Lunar and Planetary Laboratory, I studied different units of Mars' polar caps, that each interact with the Martian atmosphere and climate on different timescales. On Mars' South Polar Residual Cap (SPRC), I studied unique, spatially localized changes in brightness. This cap is the top layer of Mars' south polar cap, and is composed entirely of carbon dioxide ice, interacting with the Martian climate on timescales of one to tens of Mars Years. Through observational analyses of images, spectra and reflectance modelling, we concluded that the changes in brightness were caused by unusual amounts of dust in the atmosphere brought about by large regional and global dust storms on the planet every few years. 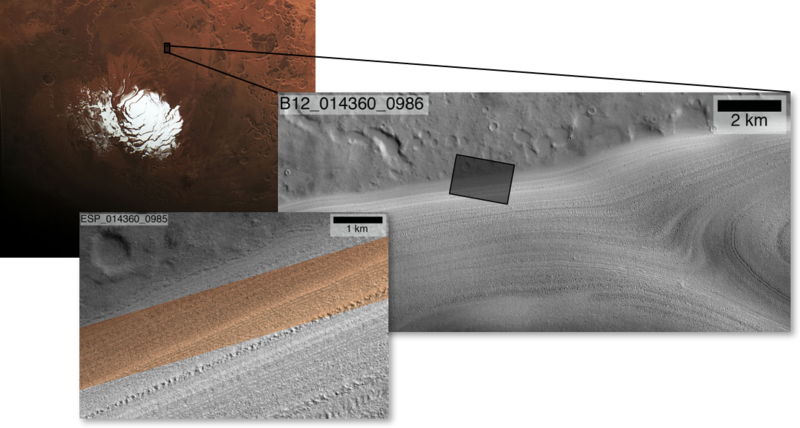 Examples of HiRISE images of eroded terrain on the SPRC that contain the brightness anomalies we called "halos". ​I also studied the connection between the North Polar Layered Deposits (NPLD) of Mars to climate changes over the last few million years. The NPLD is the main bulk of the north polar ice deposits, and it is composed primarily of water ice with some Martian dust. As its name suggests, it is structured in a series of icy layers or strata, each with differing amounts of dust, making them more or less resistant to erosion. The amount of dust and composition of each layer is related to the environmental conditions under which that layer was deposited. These conditions vary periodically due to the cyclic variation of Mars' rotational axis and orbit over thousands and millions of years. On Earth, these cycles are called Milankovitch cycles, and they affect our planet's climate, and therefore its geologic record, over similar timescales. Thanks to large canyons and troughs that dissect Mars' NPLD, orbiting spacecraft are able to observe its stratified internal structure and use these observations to construct virtual ice cores that record the planet's climate evolution. Through a combination of topographic and image analysis of these data with models of the NPLD accumulation, I was able to find a connection between the NPLD stratigraphy and the periodic changes of Mars' orbital and rotational parameters. ​Understanding this connection is key to attaining a complete picture of Mars' recent geologic history, and it is on this topic where I keep most of my focus these days. The North Polar Cap of Mars is dissected by a spiraling pattern of troughs and canyons (seen in a global image by the Mars Color Imager - MARCI) which allow remote sensing spacecraft a view of its layered inner structure (seen by HiRISE in the front image). These layers are made primarily of water ice with varying amounts of dust, which changes because of periodic variations in the planet's spin axis and orbit that affect the climate through hundreds of thousands of years. Currently, through a collaboration with colleagues here in Bern, as well as NASA and the Planetary Science Institute, I am working on correlating the images and topography of the exposed NPLD layers to the data from ice-penetrating radar, which can detect buried ice layers by the different amount of dust entrained in each layer or layer packet. This is a subsurface radar image of the NPLD, taken by SHARAD. The lines across the image correspond to changes in the electrical properties of the material within the NPLD, such as for example the change from a layer of pure ice to one of dustier ice. It also shows that the layers within the NPLD are continuous throughout almost the whole extent of the ice sheet. I have also applied the same signal analysis techniques that I used on the NPLD, to the SPLD, or South Polar Layered Deposits, which are much older and more complex. Because of this, it is more difficult to connect the SPLD to specific periods in Mars' history. Nevertheless, signals of orbital forcing (analogous to those we found on the NPLD), may be extracted from the stratigraphy, possibly leading to a yet un-discovered connection between both of Mars' polar ice sheets. Like the NPLD, the SPLD (seen by MARCI in the background) are also dissected by troughs that expose their internal structure (seen by CTX and HiRISE in the two front images). The exposed layers in the SPLD are generally thicker and more eroded and modified, which makes the detection of a climate signal much more difficult. In addition to working on these investigations, I am part of the science teams of two remote sensing instruments in orbit around Mars: The University of Arizona's High Resolution Imaging Science Experiment (HiRISE) on board NASA's Mars Reconnaissance Orbiter (MRO), and The University of Bern's Colour and Stereo Surface Imaging System (CaSSIS) on board ESA's ExoMars Trace Gas Orbiter (TGO). Both instruments are taking spectacular images of the red planet, which the scientific community can then use to understand the history and current state of Mars, and its connection to solar system history. You can learn more about each of these instruments through their instagram pages @uahirise and @unibe_cassis.